On her eighteenth birthday, Abigail Jordan foresees the death of a woman, and then it comes true. From there she goes on an incredible journey of self-discovery in which she uncovers the secrets of her past and her heritage as a timekeeper—people chosen to record and measure time, but not change it. But timekeeping isn’t the important aspect for Abigail; for her, it’s finding out what happened to her biological mother, Elisabeth. Her mother’s death was deemed a suicide, but Abigail knows that this isn’t true. In the midst of an ongoing war, Abigail must battle both literal war in the world as well as battle the ongoing war within herself. Her biological father, Mathias, wants her to learn about his world while other mysterious figures want her dead. She has to decide who to trust in order to determine where she belongs. 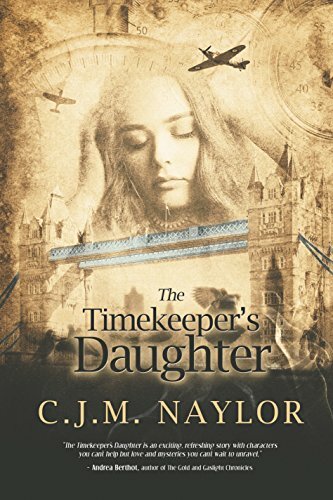 Set in 1940s era London, The Timekeeper’s Daughter follows Abigail as she goes on a journey of self-discovery all while battling issues dealing with love, family, tragedy, and trust.